- Outstanding combination of low-power consumption, reliability and flexibility performs a high efficiency of all-in-one POS solution. - Easy access to hard driver disk for improving maintenance andservice speed. - Innovative POS Stand design with cable management & powerbrick concealed. - Plenty of I/O ports highly integrate with most popular externaldevices. 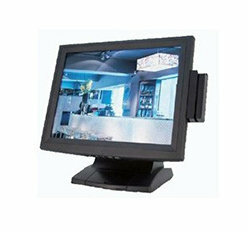 - Various peripherals - VFD, Second Display and MSR optionsincrease the integration for total solution of POS. - Sleek appearance based on small footprint brings customers avisual enjoyment and space-free shopping experience. - Flexible mounting options and wireless support build up for easy installation of any place in retail environments.